The core renewal line in operation at the Stora Enso Barcelona Mill. 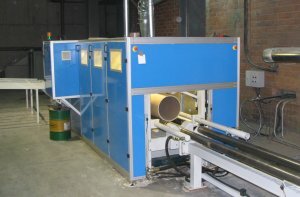 The Barcelona Mill produces packaging board by using recovered fibre. Stora Enso Barcelona is committed to increasing the value of their residuals from waste to use. In this mill the recycling of cores began in the beginning of 2006. The mill is reusing all cores from the cardboard reels received from Finland and Sweden in the mill’s internal Cartiberia sheeting plant. Nowadays, 60% of total cores utilized in Stora Enso’s Barcelona Mill come from the core renewal line.